PLATTSBURGH — Eveline MacDougall was astonished by the news report; she had to turn off the radio. She went to the piano and within minutes had captured the song’s first verse. At 17, Malala Yousafzai had become the youngest person to be awarded the Nobel Peace Prize. In 2012, 15-year-old Malala was riding a bus home from school in Mingora, Pakistan, when a masked gunman climbed aboard and asked for her by name. When he thought he’d found his target, he fired his weapon. The bullet entered Malala’s left eye socket and exited her left shoulder. The next shots fired hit the two girls sitting next to her. All three girls, though seriously injured, recovered. The Taliban had issued a death threat against Malala in 2011; for years, the young Pakistani girl had been speaking out against the extremist group’s inflexible teachings. Malala’s first speech, in 2008, titled, “How dare the Taliban take away my basic right to education,” defied its ruling that educating young girls was “un-Islamic.” Her consistent outspoken message eventually led to a BBC blog chronicling life under Taliban rule. These are the thoughts that raced through Eveline’s mind as she sat at the piano. Eveline is the director of Amandla, a Greenfield, Mass., choir she founded in 1988 at the age of 23. Initially, the group served as a form of anti-apartheid activism through song. It has since expanded its repertoire with songs from multiple countries and their native languages. Amandla means “power” in the South African language of Zulu. The power comes from singing, celebrating life and articulating social concerns, Eveline explained. The group, true to its origins, consists of over 50 members of the community from all walks of life. The chorus travels to prisons, schools, protests and a host of other venues to share the gifts of song, and hope, with people and their communities. Over a period of weeks and months, the Malala song revealed itself to Eveline. She shared it with the chorus, and they first learned it in English. Eveline then translated the song into Urdu, Malala’s native language, which the chorus then learned as well. The Amandla choir had added another powerful song to sing to whomever would listen. Its director couldn’t have predicted how it would help to nurture the closing of a cultural divide. One evening after choir practice, one of the singers mentioned that Malala would be in New England as part of her 2016 U.S. tour. And so Eveline began a series of phone conversations with the marketing group working for Malala. The young woman was scheduled to speak at the Dunkin’ Donuts Arena in Providence, R.I., on July 28. Exasperated, she decided to explain on the next call how Amandla was “a world-class choir singing an original piece of music about Malala. “Then they were interested,” she said. Eveline chartered a tour bus, and the group, spirits high, traveled the 100 miles from Greenfield to Providence the day of the event. On the drive, the choir members all autographed a book Eveline had created for Malala that contained the lyrics to the song, in calligraphy, along with pictures of courageous women in history. Amandla would perform before Malala was to speak at 7:30 p.m. The group arrived at the venue and performed a rigorous sound check, got a handle on the night’s agenda. They then were placed in a room to await their scheduled appearance time. They waited and waited and waited. Due to a tight schedule and security concerns, Eveline had known that the odds of meeting Malala in person were not good. The group rehearsed, ate a few snacks, stretched, played charades — anything to help keep their jitters under control. A security detail halted bystanders where Malala would be walking to access the stage. The singers, the youngest 9 and eldest 76, wearing bright T-shirts and multi-colored sashes, had instantly caught her attention as she rounded the corner. Eveline quickly directed the choir to spontaneously sing an excerpt of the song. Malala’s face bears the scars of the assassination attempt, but she managed a small, warm smile. When the group switched to her native Urdu, her father, Ziauddin, who was standing by her side, brought both of his hands to his heart. Tears sprang to Eveline’s eyes. Malala graciously accepted Eveline’s gifts. The producers then escorted Amandla to the stage. “We stepped out onto the stage,” said Eveline. “We started to sing, and then (Malala) and her dad joined us one verse into the song. And then the place went berserk. “Here I am directing a song that I wrote, and then the person who I wrote it for steps out onto the stage. Then there is this instant standing ovation of 7,000 people. You could just feel it in your bone marrow,” she said. Eveline has had ample time to reflect on her experience. “Nothing is out of reach,” she said. “I received a huge dose of inspiration and confirmation that what I’ve spent my entire life doing is right on target. 2008: At 11, Malala Yousafzai gives her first speech, “How dare the Taliban take away my basic right to education?” – to a press club in Peshawar. The speech is well received. 2009: Schoolgirl Malala begins writing a blog for the BBC under a pseudonym, about everything from the increased military activity in Swat to her fears of her school being attacked. 2009: The Taliban blows up more than 100 girls schools in the Swat Valley and ban girls from going to school after age 15. January 2009: Malala speaks out against Taliban on the radio show Capital Talk. A New York Times documentary film is made about her experiences. In February, the Taliban edict on women’s schooling is lifted; girls may attend school if they wear burqas. 2011: Malala, 14, is nominated by South Africa’s Archbishop Desmond Tutu for the International Children’s Peace Prize of KidsRights Foundation. Prime Minister Yousuf Raza Gilani awards Malala Pakistan’s first National Peace Award for Youth. 2012: Malala’s identity is increasingly exposed, and she is shot and wounded as she rides on a school bus. Responding to global outrage, the Pakistani government offers a $105,000 (£69,000) reward for the arrest of her attackers. 2014: Ten attackers from the Shura militant group are arrested for shooting Malala. She donates $50,000 from World Children’s Prize to help rebuild 65 schools in Gaza. On Oct. 10, Malala wins the Nobel Peace Prize. She is the youngest Nobel laureate and the only Pakistani winner of the Peace Prize. 2015: On her 18th birthday, Malala opens a school for Syrian refugees in Lebanon’s Bekaa Valley. Meanwhile, the Pakistani government admits that eight out of 10 Taliban members suspected of attempting to assassinate Malala’s have been secretly acquitted. The documentary film “He Named Me Malala” is released in the United States and around the world. 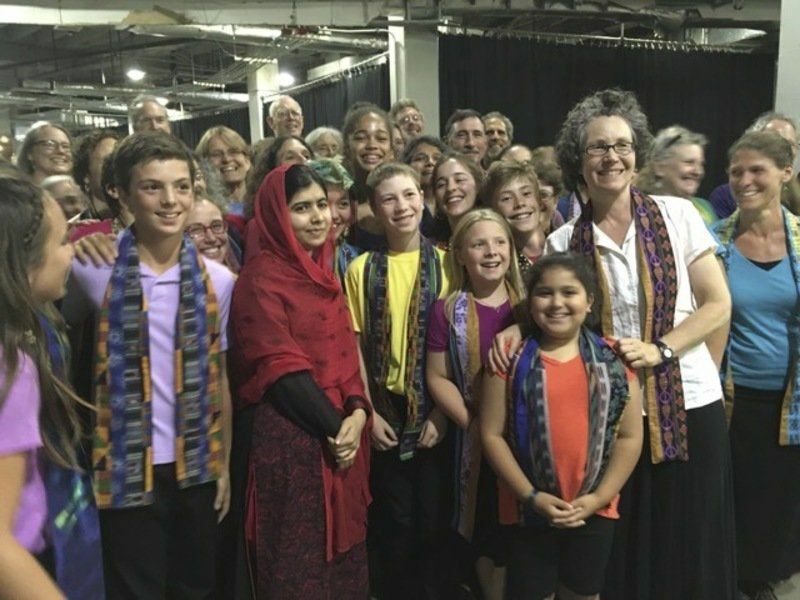 ANGIE GREGORY/PHOTO Plattsburgh native Eveline MacDougall (tall woman at right) with her Greenfield, Mass., choir, Amandla, poses for a photo with Malala Yousafzai. On this magical evening in Rhode Island, the group performed a song MacDougall wrote to honor the Pakistani woman for her courage in standing up for the rights of women in her Taliban-controlled homeland. Malala is the youngest person to win the Nobel Peace Prize.